The Tramlink loop proposed by London Mayor Boris Johnson, for the benefit of Westfield and Hammerson’s supermall in central Croydon, will cost an eye-watering £25 million. At least £15 million of that will be paid by London’s tax-payers. As Inside Croydon reported last week, the scheme – the first new section since Tramlink opened nearly 15 years ago – is intended to relieve some congestion on the trams, yet will provide considerable inconvenience for tram users compared to the current service, as passengers will have to make multiple changes to continue journeys past East Croydon. And between them, the Hammersfield shopping mall developers will be expected to pay no more than 40 per cent of the cost of laying the new tracks around this Dingwall Road loop. The Tramlink network, from Wimbledon to Beckenham Junction, opened in 2000 having cost a total of £165 million. Journalist Christian Wolmar, a prospective Labour candidate for the Mayor of London who is widely regarded as one of the country’s foremost experts on public transport, today dismissed Transport for London’s tram loop proposal, saying, that it “… looks like typical policy of pandering to developers”. TfL is “consulting” on its options, all variations of a similar scheme. In time-honoured style, the consultation is a little less than “public”: the location was almost hidden in Croydon’s Central Library, without any noticeable signage, tucked away in a small area behind the children’s section. Around half a dozen personnel were available to deal with any questions from the few members of the public who could find them, including someone going by the title of “Consultation Specialist”. Officials at yesterday’s session were able to confirm the estimated costs of the scheme, and who will be paying. While any increase in costs are likely to be met from the public purse, Westfield and Hammerson’s commitment is likely to be capped at £10 million. Based on answers provided at yesterday’s session, and from a supportive article written by Westfield’s cheerleader-in-chief, MP Gavin Barwell, the “Boris Loop” is clearly devised for the benefit of car drivers wanting to park and go shopping in the shopping centre than it is an attempt to improve public transport infrastructure or reduce the volume of traffic on our roads. “It is inevitable that more people are going to want to drive into Croydon town centre…” Barwell states is a consequence of the £1 billion Hammersfield development which the MP for the Whitgift Foundation boasted of having brokered. “The current road network won’t cope with the extra traffic so there are plans to reconfigure it. At the moment, if you approach Croydon from the north and want to go into the Whitgift Centre or Allders car parks, you have to drive all the way down to the roundabout in front of the Fairfield Halls then come back up the Wellesley Road.” First-world problems, anyone? Barwell continues: “Likewise, if you are coming out of the Whitgift Centre or Allders car parks and want to head south, you have to turn left and then do a U-turn just north of Poplar Walk. Under the new plans, there will be traffic light junctions at both entrances to/exits from the car parks. No where in the 780-odd words of Barwell’s article does he mention his status as a governor of the Whitgift Foundation, the majority freehold-owners of the Whitgift Centre, and who will therefore benefit massively from the £15 milllion-plus of public money about to be spent on changing the town centre’s tram network, all to make it less passenger-friendly. Basically, Westfield, Hammerson and their mates at the Whitgift Foundation have determined that trams crossing Wellesley Road are far too inconvenient and impractical for their car-borne customers. 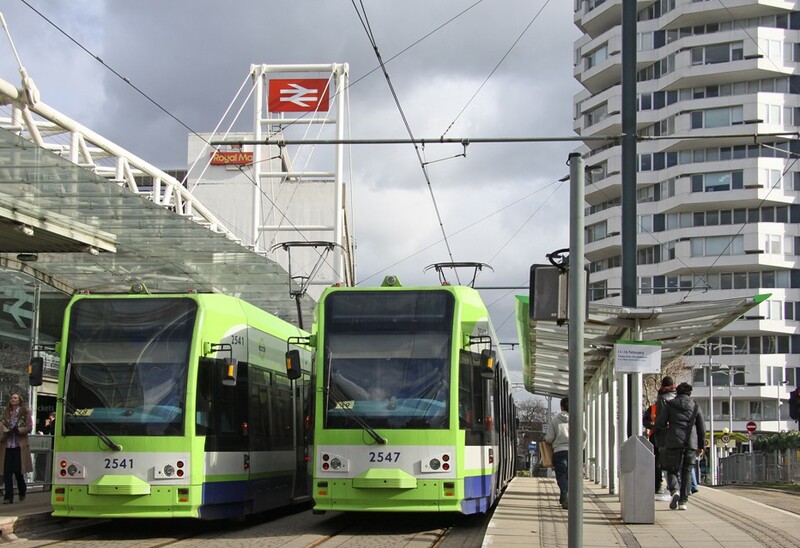 Tram usage is expected to double by 2030, resulting in up to 31 trams per hour passing through East Croydon in each direction. There is even a possibility that the Croydon Underpass could be closed in future, in order to facilitate the tight tram line curve at Jury’s Inn, as proposed in the “Boris Loop”. 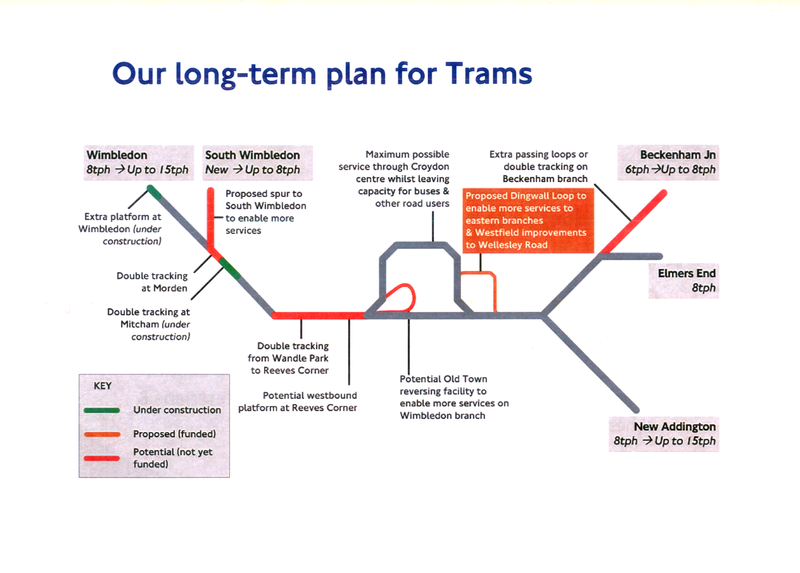 So many extra trams are expected to be using the network that a second depot is envisaged. Another reversing facility is being considered at Reeves Corner (the Whitgift Foundation owns a handy piece of real estate there, too) to enable Wimbledon trams to run into Croydon and back as a shuttle to provide extra capacity and a means of avoiding blockages in the town centre. There is also a proposed spur to South Wimbledon to increase capacity further and give access to the Northern Line. Of course, the public, and tax-payers, might hope to have their broader interests represented by their local council, which is now under Labour control. Someone to look out for them, to ensure that public money isn’t being frittered away on private interests. To ensure that our local authorities are not “pandering to developers”. There might be a slight snag with that, however. Council leader Tony Newman has appointed as his cabinet member for economic development, the key elected person overseeing aspects of the Hammersfield-isation of the town centre, veteran councillor Toni Letts. 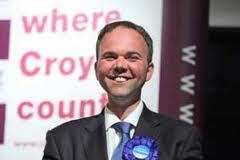 And just like Barwell, Letts is a governor of the land-owning Whitgift Foundation. This entry was posted in "Hammersfield", Allders, Boris Johnson, Business, Centrale, Commuting, Croydon Greens, East Croydon, Environment, Gavin Barwell, London-wide issues, Mayor of London, Parking, Planning, Property, Toni Letts, Tony Newman, Tramlink, Transport, Whitgift Centre, Whitgift Foundation and tagged Barwell, Boris Johnson, Conservative, Croydon, Dingwall Road Loop, Hammersfield, Hammerson, TfL, Tony Newman, Tory, Tramlink, Trams, Transport for London, Westfield, Whitgift Centre, Whitgift Foundation. Bookmark the permalink. Tramlink total cost usually given as £200 million at year 2000 prices – not £165 million. Contribution from Government £125 million with balance from the private sector. This is a short sighted and blinkered nonsense. Thousands upon thousands of people will converge on Croydon when the new shopping centre is completed. No tram, train, bus, car or railway will be able to cope with it. It is simply a recipe for disaster dreamt up by the previously run Conservative Council. Remember, they wasted millions of Council Tax payers money in building administrative offices that are now proving to be completely unnecessary. It makes me laugh when people demand a 20 mile an hour speed limit in certain areas of Croydon. I predict that should Westfield go ahead, nobody will be driving more than 20 miles an hour within a 5 mile radius of Croydon because of it. Sadly, the newly elected Labour Council appear to be equally inefficient to cope with the mess left behind. I urge people to leave Croydon at the earliest opportunity. I spoke with passion to the consultants on Monday night in the Library (No trouble finding them). They looked a little bewildered, reluctant to engage and made no notes. They wanted written responses and I duly obliged. BTW, none of the reversing links shown in the image above were shown on the consultation. I left wondering whether my responses would have any effect whatsoever and that they have no intention of changing. TfL say Option 1 will have the lesser effect on the highway. I don’t have access to scale plans and TfL can easily check but I think the track will impinge on the northbound carriageway of Wellesley Road as the turn out of Landsdowne Road cannot be less than 25m radius. This would require major changes to the highway and existing track, possibly moving a stretch of the existing southbound track in Wellesley Road to the northbound carriageway. I suspect the Wellesley Road stop would then need to move south. I do hope they have thought this through but I don’t see anything that indicates they have. Worse conditions than Davidjl2014 mentions. Westfield’s southern entrance/exit is sited just north of the underpass exit. So all north-bound traffic in the underpass is stopped completely by the 20 bus routes and other vehicles from George Street junction. These are then stopped by underpass traffic entering the shopping centre. Westfield exiting traffic, crossing Wellesley Road to go down the underpass, then stop all vehicles in the underpass wanting high-rise flats, offices, hotels, restaurants etc further up Wellesley Road that aren’t part of the Westfield scheme, which in turn block the way of those who do ! And also the surface buses and traffic ! All buses and other traffic will then be stopped a few metres further along by pedestrians on the crossing south of Lansdowne Road going to/coming from all above-mentioned thousands of flats etc, and to/from 20 bus routes on both sides of the road and East Croydon Station bridge. Moving the crossing in Wellesley Road to the north of Lansdowne Road would leave the subway to take a large number of these pedestrians – non-stop in rush hour – but Boris doesn’t like subways, so it must go, regardless of bringing traffic to an even longer standstill ! And this is just one of the ‘reconfigured’ road plans that Gavin thinks will cope with the extra traffic, but will have the opposite result – and this one doesn’t even affect the trams anyway. Croydon needs the right sort of people to come to the shopping centres to create an atmosphere where it is a joy to go shopping.